Get in and out of your pool easily with these pool steps! Designed for above ground swimming pools 48-52 inches high and decks up to 60 inches. 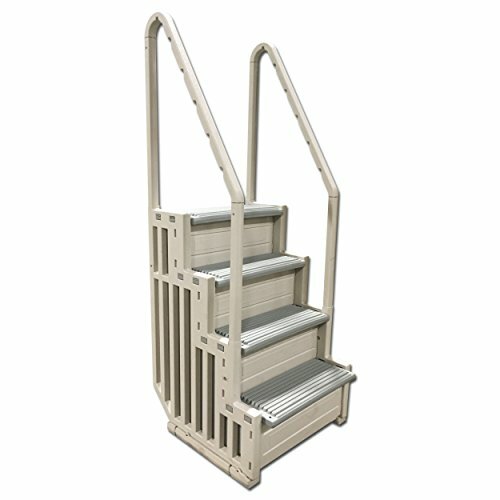 Easy, snap-together assembly with large, flat steps. Pool step measures approximately 31 inches wide x 47 inches high x 32 inches deep. Extra wide 31 in. pathway provides safe and comfortable entry/exit to and from the swimming pool. Made from resin polymers that are tough and long lasting to withstand the sun's harmful UV rays. 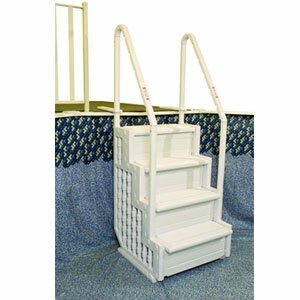 Pool steps have dual handrails and two mounting brackets to fasten the step to the deck. Maximum capacity of 400 lbs. Side supports are hollow and can be filled with sand or pea gravel to weigh the staircase down. Handrails insert into the fill holes to cap them off. Color: Warm Grey. 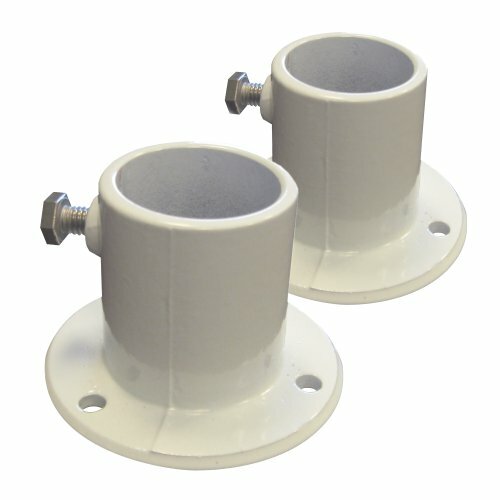 Sold as a pair, use these flanges to permanently anchor your in-pool ladder to your deck. Constructed of rugged cast aluminum, these flanges fit all above ground in-pool ladders. Inner diameter 1.5 in. 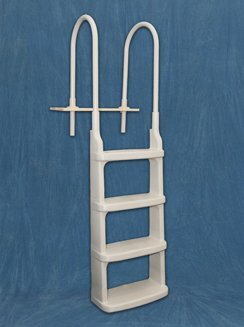 The Economy In-Pool ladder from Confer is a straight up and down, all resin above ground pool ladder that is adjustable to fit pools 46-56 inches tall. 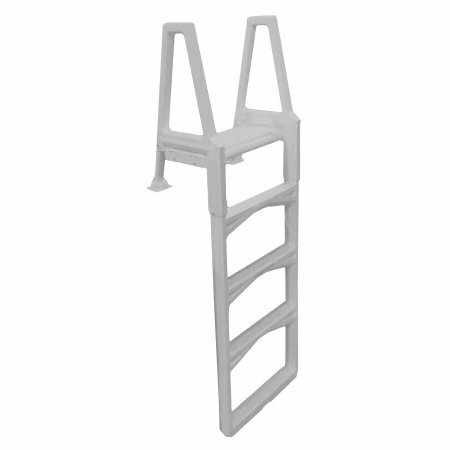 The Economy Ladder is designed for use in flat-bottom above ground pools to provide ease-of-use and convenience when entering and exiting your pool. Constructed using highly resilient vinyl resin, the in-pool ladder will not rust, corrode or fade over time. 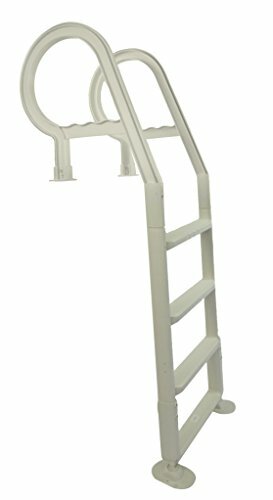 The convenient top safety platform found on the in-pool ladder allows for transitioning from the top tread to the pool deck safe and easy. The Economy In-Pool Ladder is a warm gray color to match virtually any pool or backyard decor and has a maximum weight capacity of 250 lbs. Ladder Dimensions: 18 Inches W x 56 Inches Tall. Confer Model: 635-52X. GRADUATED STEP SIZE FEELS LIKE A STAIRCASE IN YOUR POOL! Extra wide anti-slip steps for sure footing. 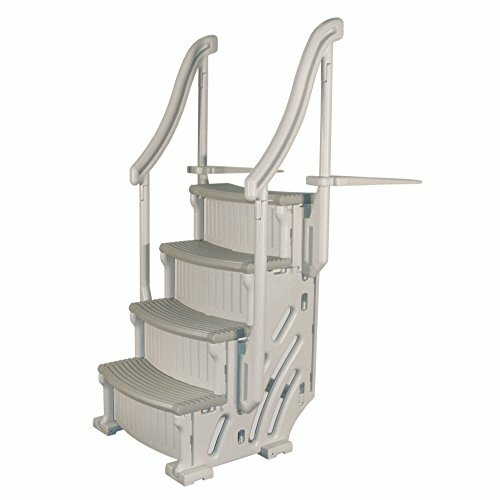 Bottom step is 9.5 inches deep, top step is 6.5 inches deep; steps in between decrease gradually in depth to provide more of a staircase feel as you climb out of the pool. It includes all necessary mounting hardware. 300 lb. capacity and can be installed on any above-ground pool deck. Should be use with flat bottom pools up to 52 in. deep. For the ultimate in convenience and style, safe access, or a place to sit and relax, the Curve Base Step from Confer is unmatchable. Its smooth, curved step treads and gentle sweeping handrails, along with a two-tone warm grey and taupe color scheme, put this step at the top of its class. This 4-step staircase is molded from super strong, chemical resistant resin that holds up to 400 pounds and will look good and last for many pool seasons. The material won't color fade and easily snaps together without any tools. The steps can be curved inwards or outwards during installation and the side panels easily fill with sand or pea gravel to weigh the steps down. This base step is part of a system and you can add on a corner section that is sold separately if you choose. Includes adjustable base pads for slightly uneven floors, oversized deck mounting brackets that are 24 inches long, and a full 5 year warranty. 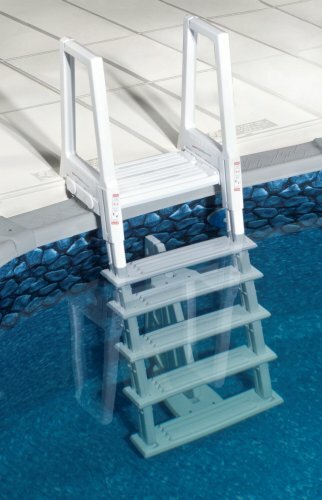 Base Step Dimensions: 32 inches D x 47 inches H, 38 inches W. Step Tread Dimensions: 27 inches W x 10 inches D and 11 inches H.
Our rugged heavy duty deluxe in-pool ladder makes getting into and out of your pool easier and safer. Quality all resin construction will not rust or corrode. The 5 tread design makes our ladder easier to climb than 4 tread ladders. 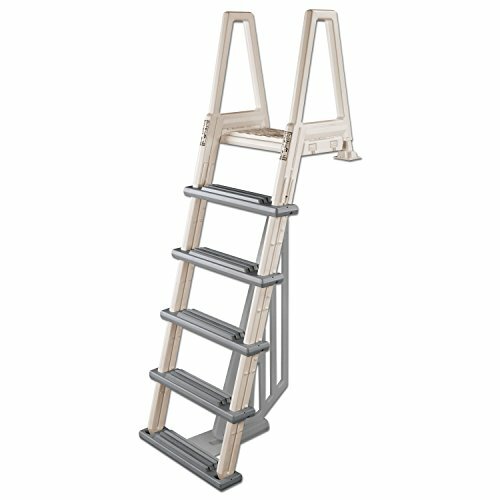 Extra deep 5-inch non-skid treads and 22-inch high handrails make this ladder safe and secure for climbing. Ladder is equipped with a child proof barrier that meets all ansi/apsp codes for safety. Adjusts to fit deck heights from 42-inch -56-inch, up to 350-pound capacity. 5-year limited warranty.